Posted by Angela Steffi on 10:57:00 PM Chocolate cake is an easy cake recipe which is loved by all ages of people. This Cake an be made very easily because it doesn't require any electric beater or a stand mixer just a wire whisk is fine. In this recipe I am using yogurt as a replacement for eggs and making eggless chocolate cake recipe. I am going to bake it in both Oven and pressure cooker so that everyone can cook with ease. This is a rich soft and a fluffy cake which can be used as a base for many other cakes like layer cake, Black forest cake and can be frosted with butter cream or whipped cream frosting to make it even richer. Lets see how to make eggless chocolate cake in pressure cooker. Then place a wire stand - to elevate the pan from touching the base . Finally a perforated plate on the top and cover the cooker. We need to preheat the cooker for 15 minutes on a medium heat without adding the Cooker weight. Step 2) In a big mixing bowl, sift in all purpose flour, Cocoa powder, Baking powder, baking powder, salt . then add Sugar and mix well. We can also use a wire sieve for mixing everything together. Step 3) Now lets add the wet ingredients- Milk, Yogurt, oil and vanilla extract , mix well with a wire whisk without any lumps. Beat the yogurt nicely before adding and make sure there are not lumps. Step 4) Divide the batter into 2 halves and transfer it to a baking pan. In cooker: 40 -45 minutes on medium without placing the cooker weight. Cakes are every ones favorite dessert, Chocolate cake is one of the best among them. 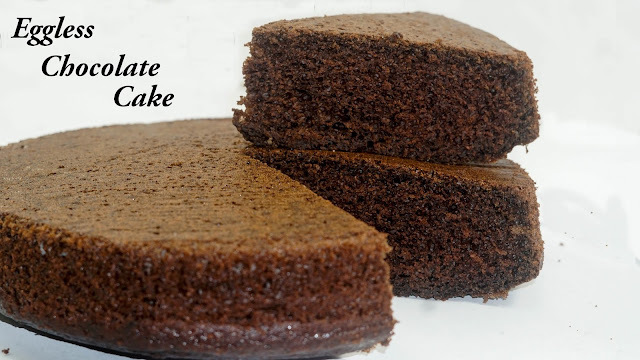 Plan chocolate cake without any cream itself is very forgiving and mouthwatering. In this video I have shared a simple eggless chocolate cake recipe in Pressure Cooker.We can ad buttercream frosting or wipped cream on the top to make it more appealing. Next add all the wet ingredients and mix without any lumps. Divide the batter into 2 halves and bake. In pressure cooker : 40 - 45 minutes on medium heat. how can we convert it into gram measurement? kindly guide me. Hello, can u pls mention the measurements in GRAMS... ALSO WITH EVG RECIPE WILL BE OF GREAT HELP.. If i want to make smaller one can i reduce the ingredients to half ? Boiled milk or fresh Milk?